DMA Radius Manager is a easy to use administration system for Mikrotik, Cisco, StarOS, Chillispot, DD-WRT, pfSense NAS devices and DOCSIS CMTS. It provides centralized authentication, accounting and billing functions. DMA Radius Manager screenshots are available here. One of the basic system diagrams is shown on the picture below. Mikrotik device is used as PPP / Hotspot server. Mikrotik PPP / Hotspot server: It controls the Hotspot and PPP sessions, sends authentication requests and accounting information to DMA Radius Manager server. Mikrotik host requires at least two interfaces: WAN for connecting to the Internet and LAN for connecting the clients. Linux server: This server hosts the DMA Radius Manager application, MySQL database, WEB server and optionally an email server. Static routing is required between the Mikrotik and Linux hosts due to the naturity of RADIUS packets (UDP). To realize the easiest IP setup configure both servers in the same subnet. With static, public IP address remote NAS devices are also controllable. Click here for additional network diagrams. The system can send SMS and email alerts for users if an account is going to expire. External authenticated SMTP servers are also supported. The SMS gateway glue code is fully customizable in a separate PHP module. Users can register themselves to gain Internet access: user name and mobile number based accounts are supported. Account identity verification is also available (SMS code). With Instant Access Services users can purchase Internet access codes online. IAS payments are realized with the help of online payment gateways (PayPal, Authorize.net, SagePay etc.). When a user clicks an Instant Access Service, the system redirects him to the payment page where he can complete the order with Credit Card or PayPal. If the transaction succeeded, Radius Manager will displays and email / SMS the IAS PIN code and password. New user registration is also available on the Hotspot login page. When a user clicks the "Register an account" link, a registration screen will appear. This form can be completed in 2-3 minutes to register and activate a new account. Accessing the User Control Panel (UCP) is simple, clicking the direct link available on the Hotspot login page. The explained functions require a properly configured Mikrotik walled garden. 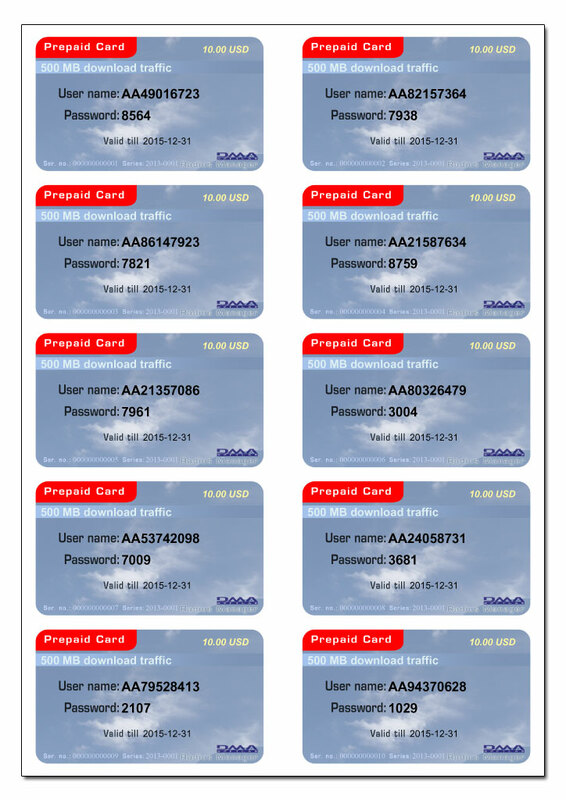 Classic prepaid cards: used for Hotspot / PPP authentication. The PIN code and password are printed on the card. Refill cards: used to refill an account balance, entering the PIN code in UCP. The system produces press ready, professionaly looking cards in PDF format. Find an example screenshot here or try the online demo. The database is fully searchable in Administration Control Panel. The CTS database requires large and fast disks. A typical daily data amount can take 100-500 MB disk space with 200-300 online users. The CTS setup requires a large HDD (1 TB or more). No need for an external MySQL db server. Linux 1 is the DMA Radius Manager server. It uses the local MySQL db engine for storing the RADIUS and CTS databases. Mikrotik 1 is a PPP / Hotspot server with special firewall rule to send the traffic details to Linux 1. Radius Manager 4 or newer version require a Linux server with Intel compatible CPU (32 or 64 bit). The recommended OS are: CentOS 5, 6, 7, Ubuntu 10-14 (64 bit version if possible). Virtual servers are very slow. DMA Radius Manager running on a virtual server has a low performance and can control 100-200 users only. 95% of customer complaints are caused by the slow virtual servers. A RADIUS based NAS requires real time response from the RADIUS server. If the RADIUS server response is too slow, the clients will get RADIUS timeout error or Authentication error (they will not be able to log in). Always install DMA Radius Manager on a native server, except if You have a really small user base (100-200 accounts max). If You have a non standard Linux system, please contact us first. We'll install a demo version on your server to be 100% sure your host will work properly later in a live environment. Radius Manager DOCSIS version is capable for controlling DOCSIS compliant CMTS and cable modem based network. Please note a DHCP based DOCSIS system has no accounting information available: traffic and online time based services are unavailable. Automatic disconnection is available for date capped DOCSIS accounts. DOCSIS cable modem TFTP boot files are generated automatically. The administrator defines the cable service as a regular RADIUS service. Data rates can be entered directly in the WEB form. The system uses a predefined DOCSIS TFTP boot file template for generating the boot file which is customizable globally or per service. Radius Manager DOCSIS version supports both routing and bridge mode CMTS devices. The system has been tested with the most widely used CMTSs: Cisco UBR series, Motorola BSR series, Arris, Juniper etc. WEB interface. Easy to use and always available multi lingual WEB interface. Fully separated code and design. You can easily customize the GUI to fit your needs. Compatibility.100% compatible with FreeRadius and Mikrotik router OS v 2.7 and newer. MySQL database integration. Utilizes a free MySQL database engine which is a part of every Linux distribution. Account management. All operations are realizable using the WEB GUI. RADIUS and DOCSIS account support. Control multiple NAS and CMTS devices and DOCSIS compliant cable modems. Traffic statistics. You can easily track the user's traffic on a yearly, monthly and daily basis. Users Control Panel. Users can track their traffic, used and remaining MegaBytes, online time, they can change their RADIUS and Linux password, purchase credits online etc. Online users list. Detailed list of the connected users. Find users easily. Search the database by various criterias. Payment tracking. Users and resellers can track the payments and generate reports. Services. You can group the accounts using freely definable services and user groups. Clear design. Clear and logical design helps You to control thousands of accounts easily. Accept payments online. Accept Credit Cards online. Multiple payment gateways are supported (PayPal, Authorize.net, SagePay, DPS Express Payments etc.). Please note, the online demo system contains fictive user data for demonstration purposes only. All changes made to the database will be reset every hour. Thanks very much for you help. I am very happy and I must say the website does not lie, you must have the best support for your product out there, I have never come across better support for any other product, I would like to buy you a beer but we are a few thousand kilometres apart! We have dealt with more than 20 companies through the Internet and we did not really find technical support for any service at this speed. I am delighted that the deal with DMA Softlab. Thank you very much! Just like to say your response and support is unbelievable, keep up the good work. Copyright (C) 2004 - 2019, DMA Softlab LLC. All rights reserved.